There's a disturbing case to report out of Alabama, where a 13-year-old girl was found beheaded in the woods last month, and now authorities are suggesting that two illegal aliens are responsible for her murder as well as killing her grandmother. It seems there's also a media-blackout on the case, with very little news agencies reporting on the horrific slaying of 13-year-old Maria Lopez and her 49-year-old grandmother and legal guardian, Oralia Mendoza. Details were brought to light this week as two criminals in America illegally, 26-year-old Yoni Martinez Aguilar, and 34-year-old Israel Gonzalez Palomino were charged with capital murder in a courtroom in Owens Cross Road, Alabama, as family and friends sat in the courtroom for the arraignment. Classmates and staff from young Maria Lopez’s school could be seen visibly crying as the charges were read aloud, according to Pittsburgh local news affiliate<a href="https://www.wpxi.com/news/national/13yearold-girl-beheaded-after-seeing-grandmother-killed-in-alabama-cemetery/789237672"> WPXI</a>. Yoni Aguilar and Israel Palomino are connected to the Mexican Sinaloa drug cartel, according to the Madison County Sheriff's Office. 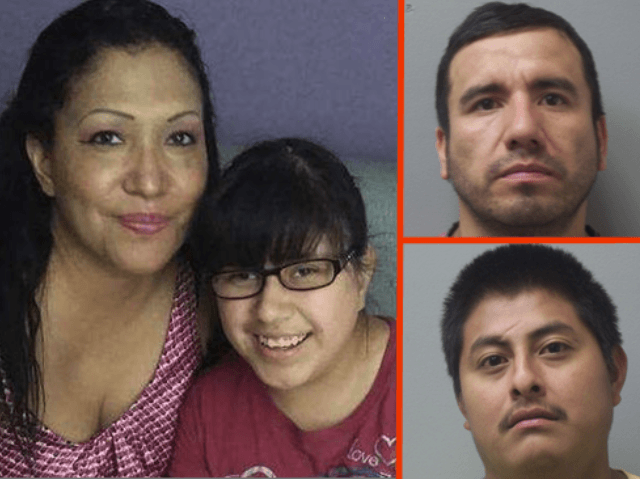 In early June, Aguilar and Palomino went on a drug run to Norcross, Georgia to pick up a large quantity of illicit narcotics, and 13-year-old Maria Lopez and her grandmother were in the vehicle at the time along with one other female. At some point during the travels, Oralia Mendoza and Palomino got into a heated argument, and the two cartel members then drove to a wooded area near Lemley Drive in Alabama, where Aguilar and Palomino stabbed Mendoza repeated times, killing her. Because 13-year-old Maria Lopez witnessed the murder of her grandmother, the pair of illegal aliens would choose to kill her as well, at a later time. The young girl would then be found decapitated, in a horrific slaying that holds the trademarks of the vicious drug cartel and their senseless executions. After authorities discovered the girl's beheaded corpse, it sends shockwaves across the community in which she's from, as well as nearby residents of the scene of the execution. For a week, authorities searched for the grandmother, whose body was taken elsewhere to be dumped. Madison County Detective Stacey Rutherford took the stand and told the court that Aguilar would later confess to the slayings, going into horrific detail as to what led up to the crimes. Rutherford said that on June 7th Sheriff's Deputies were called to a wooded area on Lemley Drive when they first found 13-year-old Maria Lopez. As part of their investigation, they were immediately led to Aguilar and Palomino, who they questioned on several occasions. During the second interrogation of Aguilar, Rutherford said that he told Aguilar their cell phone pings could put both men at the location of the murder of 13-year-old Maria Lopez, striking fear into the cartel member. At some point, he told Deputies where they would find the body of the grandmother, near Moon Springs road near Moon Cemetery in Madison County. The Madison County Sheriff's Office would then send a team to the location Aguilar described, only to find a decomposing Mendoza suffering from multiple stab wounds. When Rutherford testified before the courtroom in grim detail about the beheading of the young child, one of the family members had an outburst in rage and anguish, and had to leave the courtroom. All of those in attendance were seen crying. Aguilar also told investigators that Palomino held a knife in his hand as he pulled the girl's head back, and decapitated her in a grotesque and painful fashion. According to Aguilar, “they had to kill Lopez,” because she had seen too much of what happened to her grandmother. Young Maria Lopez was also considered to be autistic, meaning that she no doubt was a special needs child and her senseless killing could have likely been avoided. Investigators made clear that Mendoza herself had connections to drug operations throughout the region, albeit her homicide and the death of the young child were both brutal and senselessly horrific. The Madison County Sheriff's Office says the I investigation began when family members of Maria Lopez and Oralia Mendoza came to speak with investigators at the Huntsville Police Department to file a missing person's report on June 4th. Later, on June 7th, the child's body was discovered. On June 14th, the body was identified as that of Maria Lopez. That same day, the Madison County Sheriff's Office began the hunt for Oralia Mendoza. Lt. Donny Shaw of the Madison County Sheriff's Office says that they were unaware of the missing person's report out of Huntsville until they also spoke with family members, which would explain how they obtained information on the cartel connections. On June 15th, the Madison County Sheriff's Office announced the arrests of both Aguilar and Palomino, as well as the finding of Mendoza’s body. Both men now face life imprisonment if convicted, albeit the prosecution may ask for capital murder charges against Palomino where he could be sentenced to death. Both men remain in custody awaiting trial. Remember, these are the threats to the United States of America which President Trump has consistently attempting to stop from entering our nation. If these animals, <i>these savages</i>, could murder and behead a thirteen-year-old autistic child? Nobody is safe. It's also beyond time for Congress to do the job they were elected to do, and finance the border wall the 45th President of the United States of America has proposed along our southern boundary with Mexico. Call them and tell them to build the damn wall!